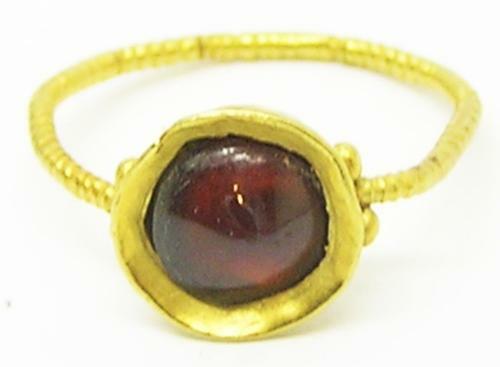 This is an ancient Roman gold finger ring, dating to the late 4th - early 5th century A.D. The ring is in intact with the original garnet gemstone. The hoop of the ring is made from beaded wire, with two globules at the shoulders. The design is identical to a similar ring (with an ovular bezel) found in the Thetford Treasure (Johns & Potter 1983, cat. no. 21) 1981,0201.21 . Another found near Hambleton (in Yorkshire) recorded YORYM-E43068, another from St. Edmundsbury (in Suffolk) recorded SF9809. This type of ring dates to the end of Roman Britain. It is intact and in excavated condition. DATE: c. 4th - 5th century A.D.
PROVENANCE: Ex. property of a private collector, New York.